As a child, I assumed that Rotherham United were a comic invention on the part of the revered Chuckles, no more real than ‘Dan the Van’. I never heard my Manchester United-supporting grandad mention them and none of the boys at my school wore their shirts, so I figured they were fictional like the other football team on kids’ TV, the Hispanola Hurricanes. It seemed far too convenient (to a cynical child like me) that the Chuckles’ hometown club not only played in the red and white of their ‘Chuckmobile’ quadricycle, but also appeared to embody the ‘Oh dear, oh dear’ catchphrase. It didn’t occur to me that the inspiration was probably the other way round. Of course, eventually I found out that Rotherham were indeed a real team, a sort of reverse Santa Claus moment. Then, in January 2007, pop ate itself when the club made Paul and Barry (real surname Elliot) honorary life presidents. The comic relief of this was probably welcome for Rotherham fans at the time as they were already looking set to be relegated to League Two  at the end of that season. This was under the management of Alan Knill, an aptly ironic name that would have fitted right into a Chuckle Brothers skit. The comic duo must have subsequently wondered if their involvement had cursed the club into farce when a promotion charge in 2007/08 was thwarted by an administration points deduction. Having failed to complete a boardroom takeover in time, the Millers then started the next campaign with a 17-point penalty before a ball was even kicked (they managed to finish in 14th, but would have comfortably made the play-offs without the deduction). To make matters worse, the club was booted out of its Millmoor home of 101 years due a dispute with the landlords. A four-year exile at Sheffield’s Don Valley Stadium followed, before new owner Tony Stewart was able to move the club into the glamorously named New York Stadium (the ground lying in the so-called ‘New York’ district of Rotherham ) in 2012. That year also saw the appointment of Steve Evans, a manager whose employment record was arguably as chequered as that of the Chuckle Brothers themselves. There was, however, no slacking under Evans as the Millers secured successive promotions to return to the Championship  in 2014. It was only the fourth time the club had reached English football’s second tier. Previous spells at this level had included a 17-year streak from 1951 to 1968, during which they achieved their best-ever league season in 1954, finishing third and missing out on promotion to Luton Town by the goal-average score. Thornhill Football Club was founded in 1870 and became Rotherham County in 1905. Meanwhile, Rotherham Town were founded in 1878 as Lunar Rovers, a beautiful name so chosen because they played their early matches at night. Town entered the Football League Division Two  in 1895, but were expelled after three poor seasons. Rotherham County would not be granted entry into the League until football resumed after the First World War in 1919. They lasted four seasons in Division Two  before being relegated to the recently created Third Division North . By 1925, the impoverished club was bottom of the league and were too facing expulsion. Realising Rotherham could not sustain two teams, County and Town set aside their bitter rivalry and merged to form Rotherham United – taking up residence at County’s Millmoor groundFN2 and adopting a new red and white kit – and their strengthened re-application for League status was accepted. So there you have it: a pair of hapless brothers sneaking back into the League in disguise, just as Paul and Barry snuck onto the pitch. And if ChuckleVision has taught us nothing else, it’s that teamwork – ‘To me’; ‘To you’ – gets the job done, albeit with hilarious consequences. The new Rotherham United rarely troubled the top half of the table until after the Second World War, when legendary manager Reg Freeman led the team to the runner-up spot in Third Division North  three years on the trot before eventually achieving promotion in 1951. Another trophy wouldn’t come for 30 years until Ian Porterfield secured the 1981 Third Division  title in his first managerial job. He left for Sheffield United weeks later and was replaced by Emlyn Hughes in his only managerial role. Despite his part in allowing Paul Chuckle to score an own-goal while under hypnosis the previous year, former striker Ronnie Moore was made manager in 1997. He guided the club from Division Three  to Division One  with back-to-back promotions and then defied the odds by avoiding relegation for three seasons, before the Millers quickly slid back down to the fourth tier under Knill. It was this sad demise, however, that led to Tony Stewart’s takeover, the Chuckle Brothers’ ascension to the status of club luminaries and Rotherham’s recent renaissance. Sometimes in football fact is stranger than fiction – even children’s television fiction. 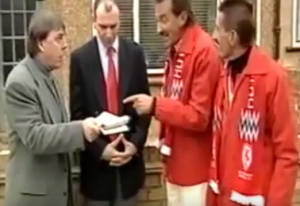 FN1Oddly, the plot sees the pair of ex-pros ask the Chuckles for directions to Millmoor, which you’d think they’d know already having notched up more than 250 appearances for Rotherham between them. FN2Rather churlishly, they also bought up the lease of the home of Rotherham Amateurs, putting that club out of business.